Indonesia's Aceh province has made a "remarkable" recovery after the devastating 2004 tsunami but many serious challenges remain, the UN says. A UN Development Programme report said rebuilding had been impressive in Aceh. But it added that more needed to be done to lessen the impact of natural disasters and to reduce poverty. In December 2004, a quake off the coast of Aceh triggered a tsunami in the Indian Ocean, which killed a quarter of a million people in 13 countries. Aceh sits on the volatile "ring of fire", a belt of tectonic activity that triggers earthquakes and volcanoes. The UNDP report, which was requested by the Aceh administration, said the region's recovery was "beyond anything imaginable six years ago". "The people of Aceh have achieved remarkable progress in the physical rebuilding of their communities, yet similar advances in key human development indicators remain elusive," the report said. In terms of poverty, life expectancy and other quality of life measurements, Aceh lags behind the rest of Indonesia. "Long years of military and political struggle, coupled with changing economic conditions and continuing natural disasters, have left Aceh today as one of the poorest provinces in Indonesia," the report said. The UN co-ordinator in Indonesia, El-Mostafa Benlamlih, told the BBC that communities in Aceh must be better protected. "If you have schools that are stronger built, if you have hospitals which are not sitting in the most vulnerable areas, if you have roads that are actually better protected, better built that is one thing. "And then you have to make sure that you do not invest in areas that are vulnerable to these kinds of disasters... you have to make sure that you don't put all your assets next to the sea," he said. 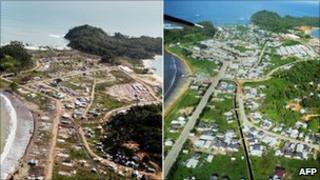 The tsunami killed 170,000 people in Aceh. The disaster helped end a 30-year conflict between Acehnese separatists and the Indonesian military, which had also derailed development and economic growth. A year after the tsunami, Aceh's separatists signed a peace deal with Jakarta and now dominate local government. The report said Aceh had made "impressive gains in participation in the political arena". However, it found that women were "still largely under-represented in decision-making at the community level" and that domestic violence was a "major concern". This first Aceh Human Development Report is based on data from 2008, the latest year for which figures are available.